One of the must delicious and simple meals we have eaten in Italy this summer is insalata di farro e orzo, a simple farro and pearl barley salad. It was often served to us as a snack with an afternoon drink but we also found it on restaurant menus as starters or first courses. Perhaps the most delicious one I had during our trip was at “Al mangiar bene“, a trattoria at the back of a small alley just off of one of the main streets in Perugia. Al mangiar bene is known for serving local, organic food and using the freshest ingredients possible. They take pride in sourcing only the best produce and they work closely with local farmers. It’s a great example of Umbrian food which is big in flavor but very simple in its use of ingredients. 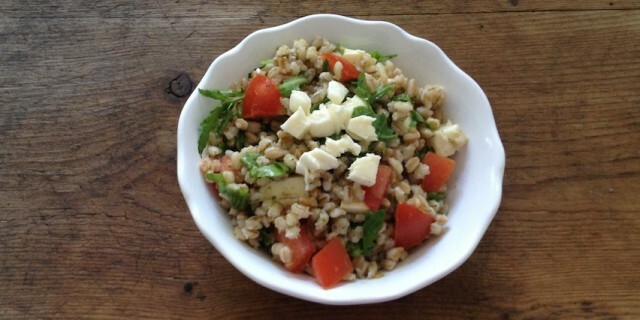 This recipe for Farro and Pearl Barley Salad is inspired by my recent trip to Umbria. The big flavors in this recipe come from using beautiful fresh ingredients such as ripe and juicy tomatoes, fresh basil, good quality fresh and moist mozzarella and a slow pressed extra virgin olive oil. For the grains I used ‘farro integrale’ (whole-grain emmer) and ‘orzo decortitado’ (hulled barley). I bought both in Italybut you can also find them at your local organic shop or a well-stocked Italian delicatessen shop. I used half pearl barley (orzo) and half farro and added just a few simple ingredients like mozzarella, rocket and tomatoes. Enjoy this simple but delicious Farro and Pearl Barley Salad as a snack, starter or main course. Cook the farro and orzo in salted water separately depending on the cooking time. Mine needed a longer cooking time of about 45 minutes but it depends on the types your using. Make sure you cook the farro and orzo al dente so the grains still have a nice bite to them. Allow to cool before adding the salad ingredients. Use a food processor or blender to prepare the basil vinaigrette. First add the basil leaves, olive oil, vinegar and garlic and process until smooth. Season with freshly ground black pepper and sea salt to taste. In a large salad bowl mix the farro and orzo with all the other salad ingredients. Drizzle the basil vinaigrette on top. Serve this Farro and Pearl Barley Salad as a late afternoon snack with an aperitivo or as a starter or main course.